New Order scouts are among the most feared pilots in highsec. They're always on the lookout for inappropriate mining activity. If their ire is aroused, they may call in an airstrike from a gang of Knights. Though a bit off the beaten track, a New Order scout reported illegal mining in the Ala system. Two Hulks promptly met their fate. The two miners belonged to Fatal Ascension, an alliance that belongs to the CFC. FA holds a fair chunk of northern nullsec. 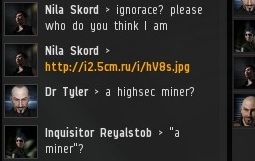 What were these miners doing in highsec? 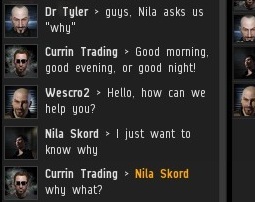 One of our Knights was convoed by Nila Skord, so he invited the rest of us into the convo. Nila wasn't one for pleasantries. She demanded answers. At first, Nila feigned ignorance. But she soon confessed that she was, indeed, familiar with MinerBumping and the New Order. Everyone knows us. Nila proved her familiarity when she linked to some anti-Order propaganda. The poster originated on an anti-Order blog that I linked awhile ago. 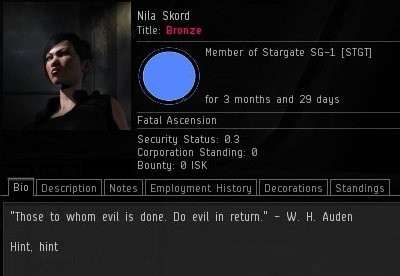 As a proud nullsec pilot, Nila had nothing against combat. But she felt that it should be restricted to special occasions. This is contrary to New Order philosophy. To us, each day is a gift. Carebears may come from highsec or nullsec, but they're the same everywhere. 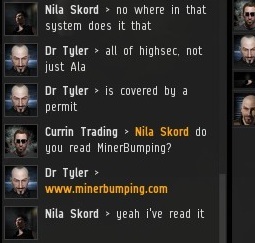 Nila decided to return to nullsec, where mining is more lucrative. So why would someone mine in highsec when they have huge tracts of land in null? Because highsec mining is far more valuable when you factor in the ability to mine AFK in almost* complete safety. 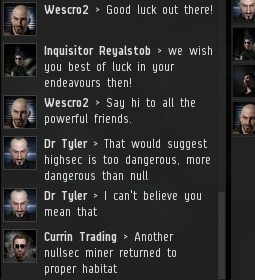 Pilots all across EVE send their alts to highsec to make money. * The "almost" is provided courtesy of the New Order. Hulkageddon - when we do it, it's fun, when you do it it's harassment. I didn't realise FA were such QQ I thought they were more pewpew. I guess 0.0 is full of carebears too. To be honest, the word "nullbear" is there for a reason. That doesnt really reflect the quality of an alliance. That said, FA is terrible. "I didn't realise FA were such QQ"
Do you think FA need to be telling their pilots the line about "don't fly what you can't afford to lose" because from the tears it looks like it came as a surprise to the AFKers. That picture looks awfully like the totally unbalanced and deranged James 315. Last time I saw him he was commanding imaginery armies in an underground bunker. CODE. (NEW ORDER GANKING CORP). = GOONSWARM ALTS they confirmed themself working for goonswarm. no rocket sciences. Quick, wear a tinfoil hat or the aliens will steal your thoughts! I have tinfoil hats for sale, some are even "Navy" (it's amazing what you do with a permanent marker). Yes null mining is that broken when it's easier to do it in empire. Although perhaps they haven't upgraded their systems yet. And they never will mining in empire. High Sec should offer low rewards for low risk. 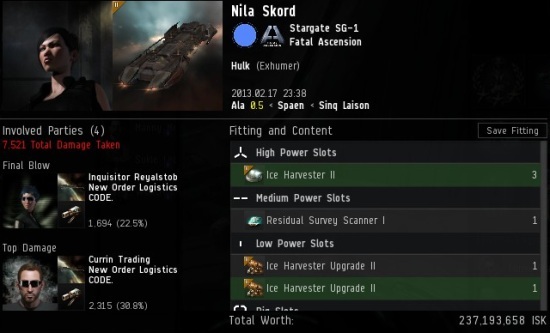 The fact that is more convenient for a null miner to go to highsec and mine AFK is wrong, something has to be done for the good of EVE as a whole. You have no idea how unbalanced highsec-nullsec is. For Monday I prepare some shocking numbers. Not random ideas, numbers. Now thats what I call shameless self promotion. Truly Shocking! 'Not random ideas, numbers.' - Er Random Numbers? You nailed that one Bobbins. Gevlon is possibly the most clueless blogger in EvE. So clueless, he even makes James 315 look good, and that doesn't happen often! He makes more ISK in financial PvP in a month than you will see in your entire gaming career. He's just such loser ... imagine, contributing billions of ISK to pay for those cats that we are using harvest Mackinaws like wheat. And then getting his ISK back by selling us those Cats! All hail James 315 and the New Order! Protector of HighSec! As an FA "overlord" I will be asking questions and poking fun at them. So, as an order member with an FA officer main, you are putting up youtube videos of clueless FA members getting Macks ganked in highsec? Even I am chuckling at this one. Hehe "leet" PvPers complaining about PvP in a PvP centric game. Such irony. Just stumbled on the Mad Haberdashers blog, and I thought I'd copy-paste a quote from his Feb 7th post, titled "Oh Look, the Miners are Pissed". "So now they are getting bumped, and ganked again. BIG surprise. CCP has even said bumping is not a petition able action. So far anyway. The mountain has come to Mohammed before and I suspect it will again. The big difference between the two groups continues to be not one of playstyle, but one of outlook. One side sees challenges, finds ways to have fun within the system, and when their sacred cows are smashed they find a new one. The other side treats their sacred cow as an irreplaceable object and regards interference with it as heresy. When the gankers/bumpers/jerks are made to change things, they find a way to adjust their playstyle to continue having their fun. The other side lets their public face be completely dominated by rubes who simply do not want to be playing a multiplayer game (except for the part where someone else pays them for their efforts) while displaying a very unwholesome disregard for their own responsibilities with regards to things like safety. Now I’m not saying all carebears are like this. Fancy Hats slid by many a target during Hulkageddon that was well tanked, that was well prepared, and we whiffed on a few that managed to surprise us as well. 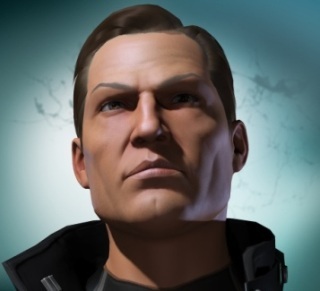 In addition there’s people like Mabrick show a very different face for the bearish folk of EvE. The problem is the forum warriors are, well, caricature-ish and the drek they spew in local when folks like James 315 start bashing on them makes me cringe. The issue with these folks isn’t that they aren’t being pandered to, because they have been, the issue is they want to have their cake, eat it, be able to sell it to someone else, and STILL have and eat it. Eventually they will run into EvE and they will A) Grow or B) Leave and EvE will be better for it." its spices the game play abit adding this ganking into the gameplay its samething no no one can take from you ganking mates. in N.O. its like i was taking about i wanted to be sailor and related to washing machine? HEIL JAMES long live the QQQ Master of High sec. James 315 hasn't mentioned "God" once in any of his stuff, Casa. Some of us in NO do roleplay religious fanaticism, in order to harvest more tears. You know, the more I read this blog, the more I want to re-sub. I shot James an email, but never got a response. How would one go about talking to a N.O. agent, without in-game comms? For people who are interested here's james 315, the leader of the lemmings on this site, attempting to speak and reason with his position on high-sec and his CSM campaign. He fails bad and he fails hard at making any coherent points. It's mainly illogical justifications for high-sec ganking. No one should be surprised by this! What? Are you kidding? That interview was a home run for 315. Xander goes after him hammer and tong, and James replies to every attack with calm and reason. Calm yeah, reason is stretching it, at points he sounded like the old bloke on the bus you don't want to sit by to avoid his boring life story and his 1960s oppinion on black folk. Post proof that James 315 is racist, punk. Analogy. Trying to be thick or? I don't think Agent Trask has to try. He's a natural. Nope. The only reason for that comment was to hint that James 315 is equivalent to a racist old fogey without coming out and saying it. A typical punk move. Nope, there was no hint - that's what it was, it was an analogy, you know like I had to point out. The way he dibbles on with his closed mind about how all miners are this and that and anyone living in highsec is this and that. Do you want me to explain more, MSpaint you a picture with lots of bright and appealing colours? Or are we understanding enough? I would be interested in seeing a rebuttal from you of the arguments he makes. Do you have an opinion on his view of miners and ratters being an essential part of the PvP food chain in Nullsec and Lowsec, or the balance of risk and reward in Highsec? I don't disagree with either of those points per se, what I do disagree with is using those points as a rambling justification to basically bully anybody he and NO feel like, there is no distinction between a new player and the 2 FA guys for example. While yes FA don't need to mine highsec, a new player, a casual player, an inexperienced player who hasn't explored the game fully should be allowed to play the game at their pace and not be punished for using highsec space to mine in relative safety, kicking the starting block from under peoples feet is counter productive in the long term. tl;dr. His points are valid, changes do need to be made, using them as an excuse to bully anyone and everyone at will without distinction undermines his legitimacy as a serious candidate, the saviour charade and virtual traffic warden following reek of troll. What about the new, casual, inexperienced player who wishes to be a ganker? I do understand your statement, anon. I just think you are lying. Your intent, as I see it, was to drop a racist slur on James 315. When you claim it's just an analogy, I believe you are lying. I think you're talking about the Mynna interview ol buddy. James killed it! Why don't you turn down the rage and try to listen to comprehend what he wants to accomplish. I did ol buddy. Which is why it's easy to see his illogical reasoning. I even semi-agree with some of his ultimate goals, but almost his methods, reasoning and ideas about how to do it are atrocious. If you believe you have better ideas, why not post them here for discussion? What parts of his platform do you find disagreeable? James poop your so full of it, its not funny any more! How can you call in air strikes in space!?! Maybe you don't know but there is no air in space! You should go and see a Doc to get the air in your head drained!!! There is plenty of atmosphere in the belt once we let all the air out of the mining barges. It also glows brightly from all the anti-matter we mixed with it.